I think I covered most of these objections in that previous (long-ish) post, but it’s probably worth clarifying here exactly what types of routes should be surfaced properly, and which ones shouldn’t be, because I obviously don’t think all rural paths should have a smooth tarmac surface, and I also think people should have fun places to ride mountain bikes (guess what – I have a mountain bike myself). The distinction is between routes that some have kind of utility function, and those that are pure leisure routes. What do I mean by this? 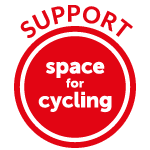 Perhaps the best way to describe it would be that utility cycling involves using cycling as a tool, a means to get from one place to another, to perform activities unrelated to cycling. By contrast, leisure cycling means that riding a bike itself is the goal. An example of a utility route would be a path that connects a village directly with the nearest town. This kind of path would be used by people doing shopping by bike, instead of by car, or by kids cycling to school, instead of being driven. It might, alternatively, be a path between an industrial estate on a ring road, and a town centre, or a new housing estate and a shopping centre. I’m sure there are countless other examples, but the essential point is that these are routes that will be used by people for whom cycling is a means to an end (getting from A to B) rather than as an activity, in and of itself. Leisure routes don’t fit into this category – they are routes that might not go from anywhere in particular to anywhere else in particular. They might, for instance, arbitrarily join up between two country lanes, or wind through a forest. Or – to pick a really obvious example – they might wind along a mountainside ridge. Somewhere people will only be riding for ‘leisure’, and certainly not for ‘utility’. Now of course utility routes will obviously also serve a ‘leisure’ function, because they will inevitably connect up with ‘leisure’ paths, and riding a bike is, in and of itself, fun. People will ride along paths that are utility routes simply for the pleasure of riding a bike, in just the same way that they will ride along roads for fun, roads that have a ‘utility’ function. And likewise people performing tasks by bike will also be engaging in leisure cycling when they do so – these are not hard and fast categories. These might be utility trips, or leisure trips – or a bit of both. The essential point, however, is that a route that has an obvious utility function should be designed for utility, even if it is used by people for leisure. simply because people who own Landrovers enjoy mudplugging along them. We design them to allow people to drive from A to B along them without even thinking about buying a special car, or taking special clothes and equipment with them in case they need to dig their car out of some deep mud. If you don’t think utility routes should be surfaced properly, that is precisely what you are demanding of other people. That they should get overalls and wellies on, and hose off their bikes afterwards (assuming they have a mountain bike in the first place), just to go the library, or visit the doctor, or go to school, or get to the train station. Or that they should somehow drive around the supermarket in a mobility scooter covered in crud. She simply won’t be there – she’s not going to go and buy and mountain bike, wellies and overalls. She’ll be in the car instead. Although it might not be obvious, the path in the photo above is a screamingly obvious utility route. It’s an old railway line that connects a series of towns and villages, and used to join the (still-existing) mainline railway to London. Partridge Green, which is at the southern end of the section I’ve marked, has a population of around 3,000 people, and (of course) used to have a railway station. Likewise, Southwater, roughly where the white box is, has a population of over 10,000 people, and no railway station. From Southwater to the railway station at Christ’s Hospital (an hour from London, and a settlement in its own right) is around 2 miles, a flat, easy trip by bike, with minimal interaction with motor traffic. Perfect for commuters, families going for a day out by train, people visiting the leisure facilities at Christ’s Hospital, and vice versa. Except the route looks like this. Now to repeat, that doesn’t mean all paths in rural areas should be surfaced in this way. The Netherlands does not do this. There are paths all over the place, winding through forests across downland, alongside beaches, through fields, which are perfect for charging around on, with mountain bikes or cyclocross bikes. These are the paths that don’t really go anywhere, or that have a very good parallel alternative in ‘utility’ form. Often these leisure routes will have an asphalt path in parallel. To be clear however, these are not ‘utility routes’, or part of any region’s cycle network. The asphalt strip simply allows people on ‘ordinary’ bikes (and indeed on mobility scooters, and other types of cycles) to use these some of these leisure routes, alongside mountain bikers. The overall point is that the Netherlands has not ‘lost’ anything by surfacing utility routes properly. The extensive leisure route network sits alongside the main utility network, and the distinction between the two is not blurred. The quality of routes that people need to use to get from A to B is never sacrificed. Yet in Britain there’s a startling parallel with those tired arguments that claim we don’t need cycling infrastructure in urban areas, because we hardly ever see anyone cycling in urban areas. In precisely the same way, we seem to believe that useful, obvious routes between destinations should continue to effectively deter almost the entirety of their potential users, simply because that route is dominated by the type of cycling that its current state will only ever allow. Tarmac can be given a surface coat of buff coloured stone chippings which does look less intrusive whilst retaining the benefits of tarmac. It does cost more. Amusingly Richmond spent a lot giving a buff surface to a cycle/pedestrian path whilst a black tarmac access road is immediately adjacent. If they were going to spend money there were more important (but more controversial ) things. I suspect that the pedestrian /dog-walker lobby is concerned that a smooth surface would make bikes go faster. OK but also more controllably. Horse riders also prefer mud, grass and soft surfaces. Nothing to do with bikes, it’s just better for horses. I expect the same is true of dogs and it’s certainly true of human feet – until it gets too muddy, of course. Any soft path used by horses will get too muddy. Walkers have the whole of Richmond Park but most stick to the gravel surfaced trail to which cyclists are confined. Horse riders prefer well drained surfaces – go to racing centres like Newmarket and the gallops are set out as strips of sand, well drained and firm underfoot (but not ‘hard’) a good bridleway will have the stone sub base of a good cycle path, but allowed to grow back weakly with grass. A good path for cycling can be built with stone and ‘blinded’ with a fine material with cementatious properties, or (as forestry roads are often built) with local alluvial material that will compact and bind a mix of sand, aggregate and clay. The end result is a firm and smooth surface which – if properly built will last for years, and cost substantially less than a tarmac path – allowing a network to be built with a minimal budget and damage of importing tarmac etc (haulage is a huge cost in path construction when tarmac and imported materials are used). The caveats for using dry bound/water bound macadam roads are 1) get the profile properly set-out to ensure no puddles/ponding, and no high velocity water running over the surface or along the edges (scour removes the fine material that locks the path in place) 2) absolute ban on any vehicles that have tyres with sipes (basically any motor vehicle) you’ll see the result in the 2 lines of potholes and puddles where motor vehicles have been allowed to run over any non sealed road surface, especially in wet weather. Is the Netherlands very sandy? It looks it in those photos, which would make sense considering the topology and history. Sand does behave very differently than other soils when it gets wet (I personally prefer wet sand to mud and indeed wet sand to dry sand). There’s much sand, but large amounts of clay and dried peatland (and a bit of loess in south Limburg) as well. However, recreational cycle routes of the type shown in the pictures are usually in woodland or heath areas, and the clay and peatland areas, being flat and fertile, tend to be heavily used for agriculture (outside cities), so woodland and heaths tend to concentrate on sand ridges and the like. Although, worth pointing out that many leisure users would also like a solid surface. I work on a site which is next to some fields and a nature reserve. Quite a lot of my colleagues like to go for a walk at lunchtime, as do I. The route can be circular and go nowhere in particular, as the point is to get some air, stretch the legs etc. Difference is, I often enjoy walking around the edges of the fields, where I almost never see anyone else. Most people will stick to the surfaced paths. Most people don’t want to specially equip themselves for a stroll, any more than for a utility trip. A properly surfaced path running next to or through trees and fields seems to be just enough nature for people to enjoy. Although I agree that we don’t have to surface everything on that basis. That’s even more true for cyclists compared to walkers – road bikes have that name for a reason. Because of that, I also agree with the Dutch usage (also shown in this post) to have some surfaced paths in purely recreational areas as well. As you rightly say, we should not surface every path – there are some who prefer sand, and there is every reason to give them their places too (also, surfacing costs money and doing it everywhere is not worth the money, and keeping some areas for those who want quietness is a good thing too) – but surfacing [i]some[/i] paths would be a good thing even where the recreational use is the only or almost the only one. Paving a former railway bed or widening a canal path is an obvious thing to do but elsewhere it will lead to problems. Once a path is smoothed out speeds will rise and anti-social speeding will occur. Another concern is that it is the thin end of the wedge. First Tarmac, then street lighting, then limited vehicle access and you have lost the wildness, or natural aspect, of the place that made it so pleasant in the first place. There should be properly allocated space for cycling on the road. Don’t be diverted by what appears to be a softer target, i.e. concreting over public rights of way in the countryside. Because these old routes are traditional rights of way, they can actually be more direct than the roads. There’s one round here which is pretty much a straight-line through a number of villages, whereas the road route means going up, round and back. But the road has a proper surface, and the old route is mud. Consequence: everyone drives between really very close villages. Why wouldn’t you want to surface that so that people can walk or cycle all year round for a mile to local amenities, rather than 3? Even if there is a purpose to the journey, people will still be attracted to a quiet, unpolluted, traffic free route as being pleasant way to travel. Rather than, say, a couple of metres from an A road, even if facilities are safe. It’s not about softer targets. We need both. Each case should be judged on its merits but asking someone to walk a mile in the winter with a pair of wellies isn’t much of an ask. The repeated attempts to open the Bristol to Bath railway path to guided bus services etc suggest that if paths are paved over it will be just a matter of time before special interest groups start explaining why they should be allowed to drive down it. Yeah but they only ATTEMPT to drive along them and I know of only one where they’ve succeeded and it was contrary to national and local policies – and arguably law but cycling organisations variously didn’t have funding or backbone to mount a legal challenge. Motoring groups successfully argue they should be allowed to drive over open fields, so this shouldn’t prevent tarmac of good cycling routes. If anything, making a route more popular should give you more help defending it from motorisation, shouldn’t it? And yet we know from observation that people won’t do it. Do we want to bang our heads against a brick wall telling them their choices are wrong, or actually make it easier for them to make those choices better? It’s not so ridiculous a position anyway. You want to go to the next village for a sunday lunch with friends, why would you want to take a chance of shoes, and a bag to put them in, when you could go in what you’re wearing? ^ This. If anyone wants a microcosm of better practice then there’s the trails criss-crossing Bushy Park in SW London. There’s no “thin end of the wedge” there. It’s not at Dutch standards but cycling-walking utility routes i.e. the more direct Hampton to Kingston lines (ca 2 miles) are largely tarmacked. Some of the footpaths are as well. There’s a perimeter non-tarmac, variable-, but never unusable, quality shared-use path in the NE for the more leisurely. There are also rough paths for cycling and walking. It can be done. It has been done. It should be done. Paul Luton’s Ham example (3:00 pm comment) illustrates another point – if you follow it 100 m or so to the river (the Thames at Teddington Lock – I always use the grey tarmac BTW) and turn left towards Kingston you are met with the buff tarmac path of NCN4. All good. If you turn right at the Lock, after another 100 m or so, almost continuously over winter, you are met with a morass of puddles and mud towards Richmond. Bike riders and walkers (and bikes/bikes; walkers/walkers) have to do a kind of pas-de-deux to get by each other using the few solid bits of ground visible. I was at the start a couple of weeks back en vélo, considering whether to carry on when an elderly (but far from frail) couple approached and had a conversation to the same effect. I looked at them, they looked at me, we nodded and turned round and went back the way we had come. Now, repeat what I have just written but substitute the protagonists with people using inclusive cycles and mobility scooters. You do quite often see these on the tarmac from Teddington Lock to Kingston, but only once in a blue moon during summer droughts on the Richmond morass. My point there is that if you care about the less intrinsically mobile having the same opportunities to enjoy the variety of the countryside as everyone, you have to provide something they can actually enjoy, and that includes the surface. Round here the councils seem to like using the compressed gravel which quickly becomes tiring to ride over any difference (cycling alongside the recently dualled A46 (compressed gravel) and recently dualled A453 (tarmac) makes it really noticeable – the latter is hillier but less knackering!). Elsewhere we the compressed gravel which is a few years just end up with lots of potholes or rutted to hell. The Downs Link path that you feature is actually pretty dull for mountain biking: for a start, it’s flat. One reason why this rather boring path is so popular is that, under the mud, there is a firm sub base which keeps it usable year round. Other local bridleways and paths are potentially far more interesting but, in summer they are rock hard with deep ruts from horses and, in the winter they are fragile with sections of deep mud. Maybe we need to improve a selected network of paths for mountain biking? A sealed surface on the Downs Link would make it easier for mountain bikers to reach a wider choice of good off-road paths. Meanwhile a decent all-weather surface would open up the huge potential of the Downs Link for families, tourism, commuting and touring. The number of people benefitting would far outnumber the current users. Other similar paths such as the Two Tunnels Route in Bath and even Center Parcs, have shown how popular this would be. You write “The extensive leisure route network [in the Netherlands] sits alongside the main utility network, and the distinction between the two is not blurred”. This sounds like you say the two do not overlap, which as you rightly wrote before, they do. I have cycled over cyclepaths that were both a fast and convenient route between a village and the nearest town, and a pleasant recreational route through a beautiful Dutch landscape. I guess what you mean is what you write in the next line – that the recreational function of such a path is not used as a reason or excuse to diminish its usefulness for utility cycling. But it would be good to avoid a misquoting on that. This post rings very true. If a route has a utility function then it absolutely must be the highest quality it possibly can. In the UK we seem to think that “urbanisation” is a curse while we watch nature from the inside of a car. If we want people to get out of their cars, then the routes must be high quality and useable all year round and cater for everyone in society. The pro-mud people should post a picture of themselves covered in mud every-day they want to commute anywhere. Curious, as this is related: do you have the phenomenon of small or medium electric scooters (and sometimes petrol ones) using paved cycle paths in the UK that I see happening more and more here in Canada? They feel similarly threatened on the roads, drive a little slower than cars usually, but once they come on to a cycle/walk path that is paved, they can be considerably more threatening to a person on a bike. Also worth knowing is that these paved roads help drivers too. Not saying it’s a wise idea to have a roadway without a parallel bicycle path on a main route for cars, but it helps to make people driving feel like they are getting a benefit too. Also worth knowing is how the Dutch control speeds on these types of roads. Outside of the built up area, the speed limit is generally 60 km/h (zonal limits) on these back lanes and the small routes connecting small towns and villages, sometimes cities to towns. These are divided into 2 main groups. The small back lanes, are usually around 3 metres wide, are usually asphalt but also sometimes have concrete tracks with grass in between the tire tracks, or sometimes brick, but does vary of course, are extremely low volume. Even at 60 km/h, or 40 mph, because of the low volume, it is OK to ride there. There is usually no controls at intersections, no signs, no signals nor a roundabout. Just a sign saying what the name of the road is and sometimes if it’s on a recreational route for cyclists, that will be signed. The other group of 60 roads are wider, about 5-7 metres, with no centre line, a pair of dashed lines slightly in from the side of the road, and is always paved. There is a cycle path next to it. These routes take traffic between villages, smaller towns and occasionally smaller cities to each other, and are no more than routes within counties. City to city routes are usually 80 km/h roads, these will have bicycle paths next to them, and are usually connected via roundabouts, and province to province, or in the UK, county to county, routes would be 100 km/h 2 lane expressways or 120-130 km/h motorways. Cycle paths have the priority of the road they parallel. If the road they parallel faces a yield sign, the cycle path will as well unless it avoids the conflict, like at a roundabout. If the side road faces the yield sign, the cycle path will not have a yield (or give way I guess) sign, unless it would be dangerous to do so. Some of our recreational network in the Netherlands used to be paved with sea shells. Really nice for riding bicycles on, but it takes some maintenance. But loam paths with gravel work fine too, provided they’re not used by cars and horses of course. What paving material is the last route paved in?